Whenever an event flooring contractor comes to us, they almost always have the same question - which adhesive should they use to hold their event flooring securely so it doesn’t wrinkle, ripple, or gap throughout the event. 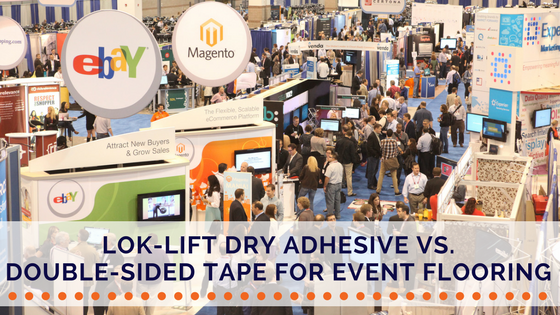 Dry adhesives like double-sided tape and Lok-Lift are two options that can be very effective, and there are advantages to each. Let’s go over them below. Double-sided tape is often an attractive option for customers because it is so inexpensive, costing as low as $2.50 for a 75-foot roll. It’s a very aggressive adhesive, which can be both an advantage and a disadvantage because it will almost certainly keep your event flooring in place, but can also leave heavy residue and possibly harm the floor or subfloor underneath your installation. Another problem is that it doesn’t provide full coverage, so wrinkling and buckling can occur as more and more people walk across the flooring. Lok-Lift is a releasable dry adhesive system that comes in two strengths. The first is more aggressive, designed for very heavy traffic installations, and the second is a lighter version, ideal for situations where you need a secure hold but want ensure the floor or subfloor beneath your installation is protected. Lok-Lift is quick to install. It doesn’t require the long curing times and gassing periods associated with traditional wet glues. Once it’s installed, it’s ready for immediate foot traffic so the event can begin. Lok-Lift is easy to remove. It’s vertically releasable, meaning that the event flooring can be removed by simply pulling it at a 90-degree angle from the floor. It will stay secure if it’s pulled in any other direction. Lok-Lift won’t damage the floor below. It leaves minimal residue behind once removed so the floor below (whether it’s carpet, concrete, hardwood, or any other surface) can be cleaned and restored to its original condition. Lok-Lift provides full coverage when necessary. Vinyl floor coverings require full coverage adhesives because of their linear expansivity. A product like Lok-Lift will provide this, whereas a double-sided tape will not. The downside is that it is more expensive than double-sided tape, costing 33 cents per square foot. 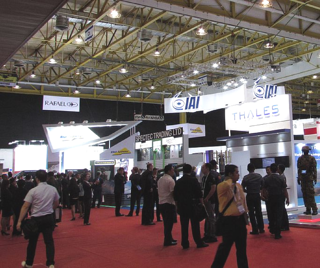 Which Adhesive is Best for Your Event Installation? Every situation is unique, so there’s no one-size-fits-all solution. 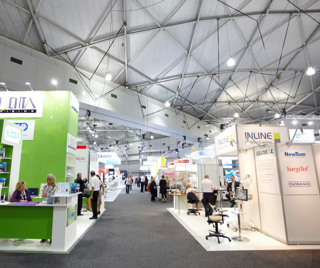 If you have questions about the adhesive that’s best for your event or exhibition flooring, please contact one of our product specialists.